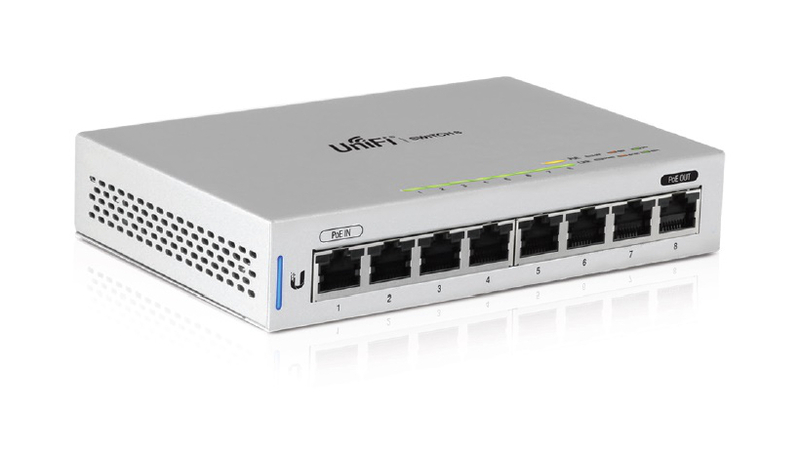 The UniFi® 8 Port Switch is the base model in the UniFi® switch range. The US-8 model has 8 Gigabit Ethernet ports Port 1 is PoE In and Port 8 is a Passthrough port. The UniFi® US-8 can also be powered by PoE on Port 1. Port 8 Passthrough is use to power you PoE devices. The item comes with a passive power supply. When the UniFi® US-8 is powered by 802.3af PoE Switch then the Passthrough port doesn’t pass power. If powered by 802.3at PoE Switch the Passthrough port passes 802.3af. When the Passive Power supply is use then passive 48V power is available on Port 8. Supported Voltage Range: 48V Mode: 56V to 40V, 24V Mode: 27V to 20V.